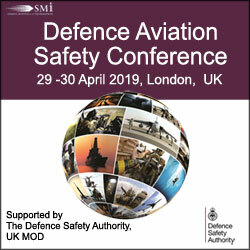 SMi Group is thrilled to announce that registration is open for the Defence Aviation Safety Conference, taking place in London on 29th and 30th April 2019. With support of The Defence Safety Authority, UK MoD, it is with great pleasure to announce that the event brochure is now available to download from the website. Book your place now (http://www.defenceaviationsafety.com/airsup) to qualify for a £200 Early Bird Discount – valid only until 31st January 2019. The conference agenda features 22 military speakers, including 5 essential briefings from the UK MoD, showcasing the very latest strategies and technologies being used to enhance aviation safety across a broad range of platforms and systems.